Benihana’s Hibachi steak is loved by all. You can recreate this flavor at home in under 30 minutes. It’s easier than you think to recreate this masterpiece. Benihana’s is known for its hibachi steak. Although going to Benihana is a fun outing, you can duplicate this steak at home. It starts in a skillet and finishes in a delicious soy-ginger sauce. Not only does the sauce enhance the flavor of the steak, but it’s also a great recipe for entertaining. The key is to select the best steak – here’s a video showing how Benihana does it. Like all the best Japanese stories, the history of Benihana began with the descendant of a samurai warrior (Yunosuke Aoki) and a coffee shop in Tokyo. Just after the war, Aoki, a popular entertainer, had the idea to open a coffee shop with his wife, Katsu. They called their shop Benihana, and because of food staple shortages, Aoki rode his bike more than twenty miles to buy real sugar for his shop. After college, Aoki’s son Hiroaki (or Rocky, as he became known) moved to the U.S. to pursue his dream of opening his own restaurant. He wanted to combine his father’s knack for doing something unusual with truly memorable food. As Rocky didn’t have very much money, he began life as an entrepreneur by selling ice cream in Harlem while going to school at night to study restaurant management. The ice cream venture turned out well thanks in part to the colorful Japanese cocktail umbrellas Rocky added to his treats. In this way, he managed to save up $10,000 so he could open his first Benihana restaurant in 1964. The original Benihana is still going strong on West 56th street in Manhattan. It features an authentic Japanese farmhouse look and delicious food cooked on steel teppanyaki grills right in front of the eyes of customers. Highly trained teppanyaki chefs delight customers with theatrics and intricate knife work. You can watch a demonstration. The chefs slice and dice and dazzle your eyes. And, the food dazzles your taste buds. It’s one of the best shows in New York City. Make your own Benihana hibachi steak at home. 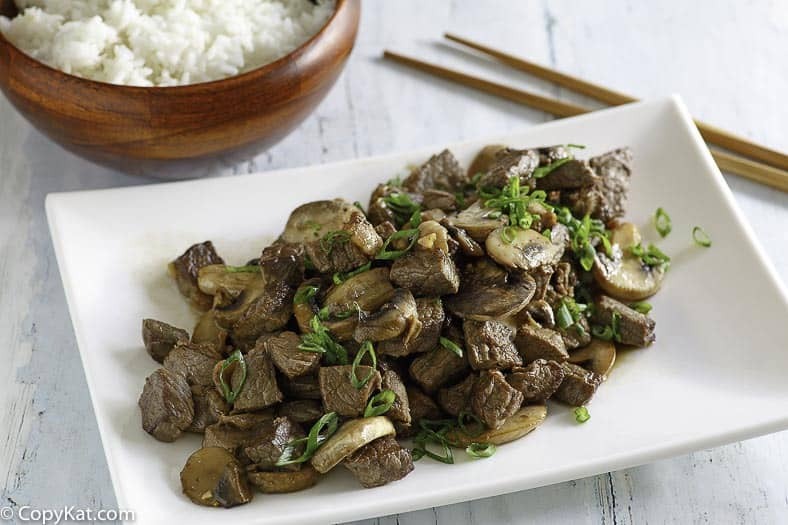 Although this steak dish is called hibachi steak, at Benihana the steak is actually cooked on a teppanyaki grill – click here to read about the difference. Don’t have a teppanyaki grill? No worries – this recipe improvises with great results. However, it’s advisable not to try to imitate the Benihana knife tricks! Love Benihana? Be sure to subscribe to my mailing list, to get new recipes! Make your own Benihana Hibachi steak at home. Prepare steak marinade, and place meat in the marinade for at least 1 hour before cooking. 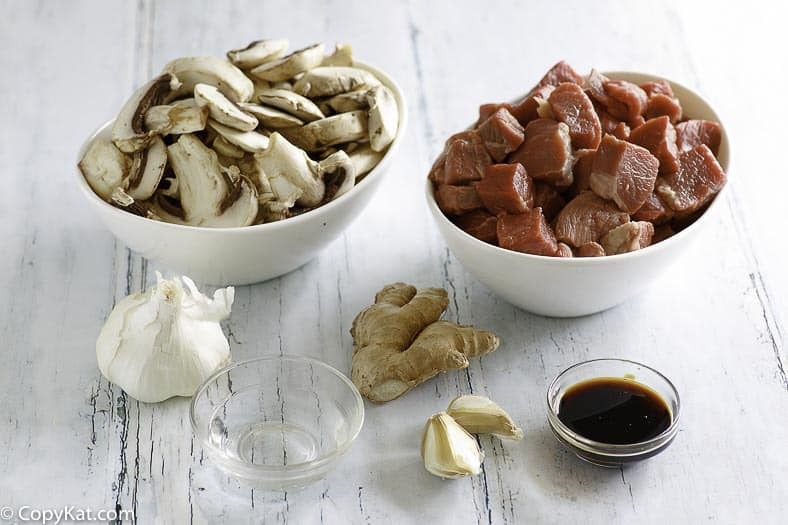 Remove steak from marinade and cut into bite-size pieces. Heat a skillet to medium-high add oil, and then steak pieces. 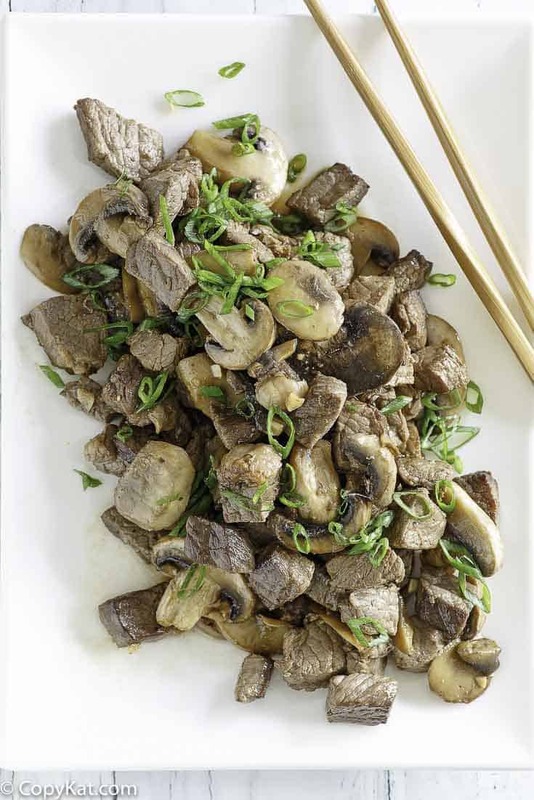 When the steak pieces are close to being cooked through, you may need to add a little more of the soybean oil add the mushrooms. 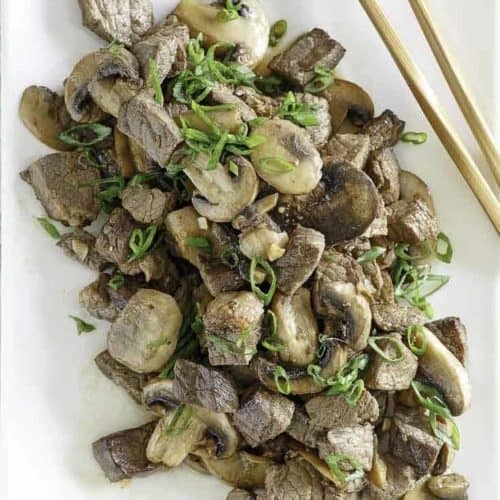 Season steak and mushrooms with salt and pepper. Is there anyway you can send me recipe to cook hibachi steak and rice. I’ve been going to restaurant and paying close attention to step, just not to sure of ingredients. They use two types of brown liquid one on rice which not sure what it is and both on steak. Also what is the green butter and can I get at market? Thank you look forward to reply. My son and I ate at a Japanese steak house last night and I asked what the two different brown sauces were. The chef told me soy and teriyaki sauce. The pink dipping sauce is call Yummy sauce and the red dipping sauce is ginger sauce. This steak is so good at Benihana’s I will have to try it at home!